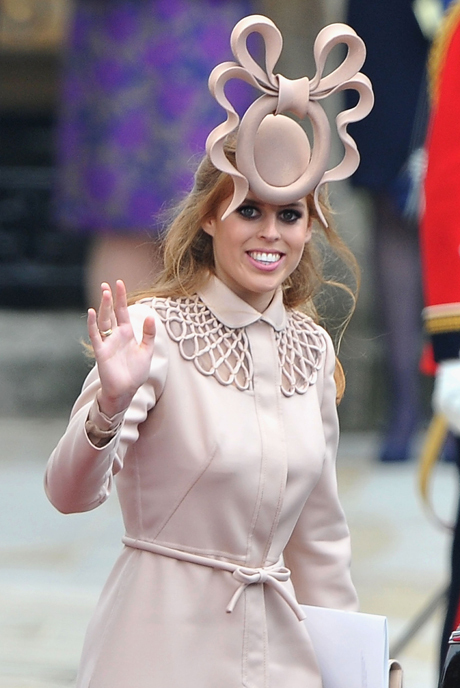 The 22-year-old royal listed the bizarre Philip Treacy creation on auction website eBay in order to make money for the Little Bee Initiative, a charitable organisation set up by the princess to raise money for Children in Crisis and Unicef and she is astonished by the response so far. Bidding on the hat – which has been compared with pretzels, spaghetti and toilet seats in spoof internet videos – was started by British businessman Duncan Bannatyne, best known for his role on UK TV show 'Dragon's Den', who offered £5,000 within minutes of the listing going live. Other high-profile bidders have included Australian children's group The Wiggles, who offered to pay £17,500 for the headwear. Blue Wiggle Anthony Field said: "We wear some pretty crazy costumes on stage, but this hat beats them all - it could bring about an Australian republic all by itself! "When we heard about the auction we knew we had to bid - we're ambassadors for Unicef and we think it's great that Princess Beatrice has chosen to support children in great need." They also joked they would donate the accessory to the Australian cricket captain to use next time the team play England. Anthony added: "We might give it to Michael Clarke to wear when he bats against the Poms next time - it would certainly distract the bowler." Speaking about the auction – which closes in four days time – Beatrice has said: "I've been amazed by the amount of attention the hat has attracted. "It's a wonderful opportunity to raise as much money as possible for two fantastic charities. I hope whoever wins the auction has as much fun with the hat as I have."